Metallic Flo, a 3-year-old Metallic Cat daughter in training with T.J. Good, was the high-selling lot, at $60,000, during Western Bloodstock Ltd.’s NCHA Super Stakes Sale on Saturday, April 18, at Will Rogers Equestrian Center in Fort Worth, Tex. Cancan Reyvolution, an8-year-old gelding sired by Dual Rey brought $40,000, as the sales second-highest seller. The Top 10 sellers averaged $28,000, representing a 23 percent increase over the sale’s 2014 Top 10 sellers, and the Top 20 sellers averaged $22,150, a 22 percent increase over 2014. The sale’s net average of $11,341 on 76 horses sold represents a seven percent increase over 2014 sale, figures, while the percentage sold remained at 73 percent, from 104 lots, with a gross average of $14,725. Metallic Flo, consigned by Alan Chappell, Gainesville, Tex., was purchased by Cody Erwin, Vancouver, Wash. Cancan Reyvolution, the 2011 NCHA Derby Non-Pro champion and NCHA earner of $145,837, was purchased by Kent Arnold DVM, Terrell, Tex., from John and Lica Pinkston, Alice, Tex. Purrfect Playgirl was the high-selling 4-year-old at $25,500. The High Brow Cat daughter, in training with Bill Riddle, was consigned by Glenn Drake, Napa, Calif., and sold to Juan Carlos Rengel Leon, Valencia, Venezuela. Smart Metallic RG, at $22,000, was the high-selling stallion. The 4-year-old Metallic Cat son, in training with T.J. Good, was consigned by Mariposa Farms and purchased by Billy Gene Crenshaw, Kountze, Tex. 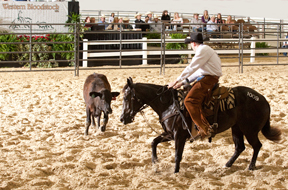 The NCHA Summer Spectacular Sale, August 1 at Will Rogers Equestrian Center in Fort Worth, is the next sale on Western Bloodstock Ltd.’s agenda, followed by the Center Ranch Production Sale, in Centerville, Tex. on October 10, and the NCHA Futurity Sales in Fort Worth, in December.